No you dont have to worship the developers first to post your opinion, but that also does not mean that other people cant answer your post either. As long as the answers are done in a normal way, than that should be fine. Well saying that content x is a basic in your view and should be in the game from the start makes it kinda read like DLC with exactly that content would make the basic game an unfinished product because it had to be in it from the start. Maybe you did not mean it but it can be imo read that way and people do use it that way to state that its an unfinished product even though its just something they have wanted and not something that was cut just to sell it later. So if they for example do release a Coliseum as DLC then this would be in your view very bad (saying that you would be seething and that it should be undeniably in the first release) But in the end thats is still just your opinion and not a fact. And for you it might be poor work or poor decisions that millions of people still reward (which honestly is quite negative and not just slightly) but for others they just see that the team did everything they could in the time they had, made a product that has its flaws and will not make everyone happy but that still shows quite the love and now when they are finished they are putting quite the bit of time into something that they will give us for free and that will probably be much better now that they had the time to really think it through instead of just slapping it into the game from the start with no feedback. Right, I think this was just a situation of either upper management being a factor, creative differences being at play or the lack of disc space present (which to be fair, we were told this numerous times if memory serves correctly). Top to bottom, the game is a fully-finished polished product that doesn't require DLCs for you to understand what's going on. If there's any narrative gaps, you can pretty much infer what happened in that time, getting clarification is a great way to add more content, but it's not like the game is broken without it. Point is, I think the fact that they're still working extra hard on the Critical Mode DLC even months after the game's release says a lot about their love for the game itself, the series as a whole and the fans. Some developers could've said "that's all folks" and that would've been the end of that, but they're still listening to feedback and are willing to bring (I personally believe) great things on the horizon. Sure, it would've been great to have things right then and there, but I actually like it this way better because it gives us more things to look forward to, instead of it just being the game, an Ultimania a month later, maybe some interviews here and there, and that's it for the next few years. MAYBE a Final Mix at some point (unless it was a side game). So I'm perfectly content with what's going on, I think it's exciting. We watch the movies over and over and over again and really want to get it right, so we discuss that with our partners at Disney, see what they think throughout the plot. Nomura: How are we gonna handle the plot for Frozen? It makes me wonder what ideas Nomura and the developers have for worlds before Disney vetoes or changes them. I honestly would really like a KH3 documentary, because there's so many insightful things that could come out of one. “As a game designer, I really just go back and think about what my kids would love about the characters and what they would want to do with them... Just being honest and standing back and seeing what your kids or your fans would want to come up with ideas for that." Do you know what kids (like Andy from Toy Story) love doing with their toys? They like to mix their toys together and have them interact. This series is stagnating narratively because they are so obsessed with keeping the majority of Disney characters on their own individual worlds, not interacting with characters they don’t normally interact with (aside from MDG and OCs) and not coming up with interesting stories for them as a result. They mainly just adapt the old stories with nothing terribly interesting added in. Can we please get characters leaving their worlds more? Maybe characters that join your party could stay in your party. Maybe the worlds could be joined together again like they were before the Keyblade War, but without the barriers between them. Just give us something new please that doesn’t rely on inserting more of Nomura’s stylish but bland creations and actually does something creative with the tools he’s given and is obligated to use. What do you think this is, a crossover series? Disney has stringent restrictions about their own characters interacting. They allow it under specific circumstances but Nomura has stated many times before that Disney has unique rules about how they have film properties work together. The less money a film made, the less likely Disney will restrict it, and of course they are more lax about other characters that are not a originally part of the film properties. The world barriers thing is just Kingdom Hearts’ way of having a canon reason why these characters don’t interact. It isn’t the reason they don’t, it’s the workaround for Disney’s limitations. We’ve seen that when given less stringent guidelines or when they are forced to be creative to work around something (and they have a good budget), they make very fun storylines, so it isn’t a lack of them wanting to try and do something different. It’s a difficult problem that I don’t think will ever change without Disney changing their philosophy. They got good reception with WIR2 having the Disney Princesses in, so perhaps someday they will ease their restrictions. It's such a bummer too, I think crossing the disney characters would be the next step for the series to go to. Disney kinda did it at times also with the Hercules and Aladdin tv show, so perhaps a faint glimmer of hope and KH III's sales number could eventually do it. KH began with the story of a boy crossing these boundaries between worlds for the greater good, so it really would be a step in the right direction. 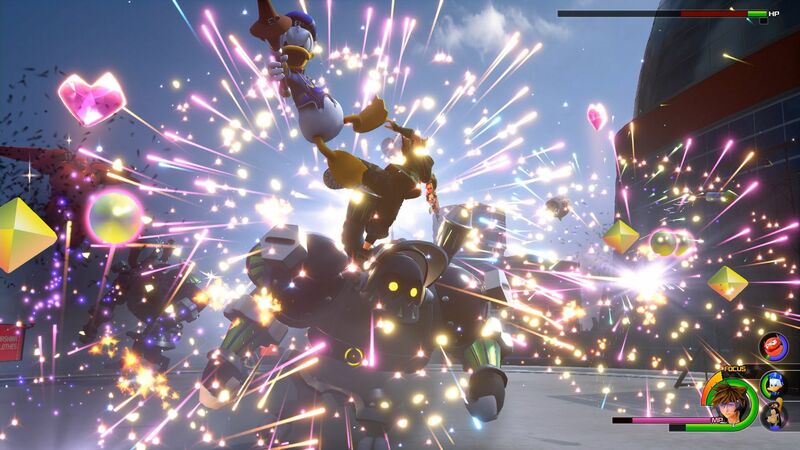 However, I do also sympathize with Disney when it comes to their hesitation to these crossover possibilities, or at least when it comes to Nomura's hit-or-miss writing.